Cactus Industrial is delighted to unveil our new warehouse and central office base in Blantyre, Scotland. Over the last few years Cactus Industrial’s growth plans have progressed at a significant rate. Since arriving at our previous address at Bothwell Industrial Estate, our client base and the diverse industries Cactus serves continued to grow. To cope with the demand of our Surface Preparation tools and our Composites and Coatings solutions, we found a new warehouse and office space at Blantyre Industrial Estate. As the UK and Ireland’s sole distributer of the Monti Bristle Blaster, the new warehouse allows us to stock more hand-held tools, ready for quick shipping to our clients across the country. With a temperature control facility inside, our Composites and Coatings are stored at the optimum levels, ready to provide repair solutions and protective coatings requirements. 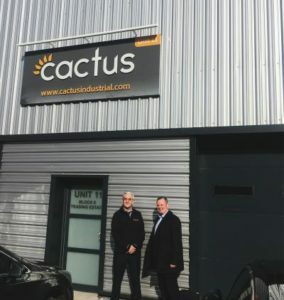 With space for our offices within the warehouse, it proved the perfect opportunity for Cactus to continue to operate from a prime Central Belt location. “The Bothwell Industrial Estate offices we shared with Keedwell Logistics served Cactus really well, but it was necessary for us to get a much bigger space from which to run our operation from. More and more companies are getting in touch with Cactus. They want to know how our products and solutions can ensure their equipment’s surfaces can be repaired and re-built to protect, regardless of the environment they operate in. With a growing client network and even bigger plans in the pipeline, we had to find somewhere to stock much larger volumes of our Bristle Blaster and our Composites and Coatings. Being at Blantyre Industrial Estate keeps us in the Central Belt and ensures it’s easy to catch up with clients who could be anywhere from the North of Scotland, over in Ireland, or down in the South of England,” said Jamie Gallagher, Director of Cactus. Among the first to visit our new Blantyre premises were Malcolm Smith (left) and Paul Leneham (right) from Chesterton. Chesterton manufactures high performance coatings and following a client’s CPD seminar on Water and Waste Water solutions, Malcolm and Paul enjoyed a tour of our new facility, seeing where their products and solutions are stored before they’re distributed by Cactus to businesses across the country. We’re very excited to launch our new base and continue to offer an incredible service to our clients across the UK and Ireland!